Are you a general surgeon, oncology surgeon, plastic surgeon or any other specialty that can benefit breast cancer patients? Most breast cancer cases diagnosed in Kenya are stage 3 and 4 with advanced metastasis and almost any surgery specialty can help. 15% of breast cancer cases diagnosed in Kenya are Fungating Breast Masses. Cancer Free Women foundation would love to hear from you. Located in the Eastern part of Africa, Kenya is one of the most visited tourist attraction in the world with some of the most fascinating big cats and world’s big-5. Come volunteer your surgery expertise in Kenya and help save breast cancer women that have nowhere else to go or nothing else to do, than t wait for death. 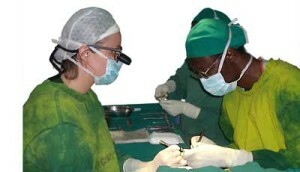 While our main focus is breast cancer control in Kenya and East Africa, we do not filter any surgery specialty. This is because most of our breast cancer patients also have other surgical needs. Volunteers in other specialties like pediatrics and orthopedic help Cancer Free Women strengthen its roots around the world. We have medical mission trips to Kenya specifically tailored to give you best volunteer opportunity and fun while you are abroad.